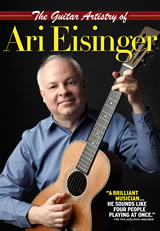 Ari Eisinger's DVD Guitar Artistry of Ari Eisinger from Stefan Grossman's Guitar Workshop. In this video, Ari plays some of his best songs and talks about his music and his musical influences. He plays and sings the following songs and tunes on this video. Or send a check via the postal service. 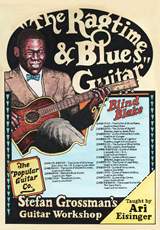 Ari Eisinger's instructional video The Blues & Ragtime Guitar of Blind Blake from Stefan Grossman's Guitar Workshop. 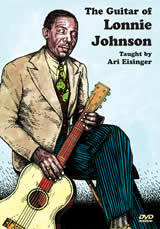 Ari Eisinger's instructional video The Guitar of Lonnie Johnson from Stefan Grossman's Guitar Workshop. Ari Eisinger's instructional video The Guitar of Blind Lemon Jefferson from Stefan Grossman's Guitar Workshop. 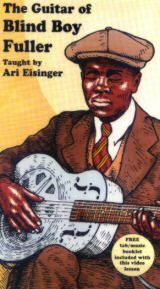 Ari Eisinger's instructional video The Guitar of Blind Boy Fuller is the first in a series in progress for Stefan Grossman's Guitar Workshop. Jim Coen's review in Guitar World Acoustic (Fall 2000 issue) gives it four stars and says it is "...a service to blues students and, thanks to Eisinger's accurate recreation of Fuller's music, a fitting tribute to Fuller's amazing career."